There was little improvement in cell service today in the U.S. Virgin Islands following Hurricane Irma’s destructive path with 54% of affected areas without service, only a 1% decline since yesterday. Florida saw a slight drop of approximately 2% at 24.6%. Alabama fared well with only 1% of cell sites out of service. Georgia, according to the FCC, has 10.5% of cell sites in the disaster area out of service. In Florida, Monroe County suffered the biggest lost with 82.4% of its 108 cell sites out of service. Hendry County had 78.3% of its cell sites down and Collier County trailed them with 72.6% of its 212 cell sites out of service. 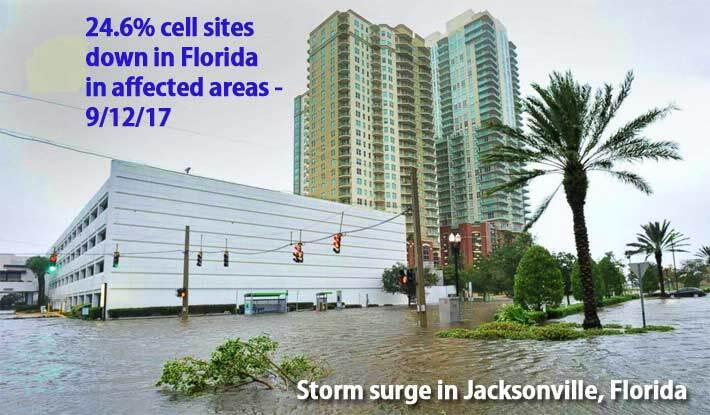 Almost 25% of Florida’s cell sites in the affected areas were down, totaling 3,618. As a comparison, Hurricane Katrina knocked out more than 1,000 sites when it hit New Orleans in 2005, according to the FCC. When Superstorm Sandy hit the eastern US in 2012, roughly a quarter of the wireless networks in the affected area were down. By contrast, just 4% of the 7,804 cell sites in Harvey’s path experienced outages during the storm, according to the FCC. That’s less than 400 cell towers. Verizon said close to 90 percent of its facilities were currently working, with many running on backup generators. “Massive refueling operations are underway to ensure those sites without commercial power continue in service for our customers and first responders,” the company said in a statement. Even though cell service is available in many Florida cities, there are massive internet outages with AT&T, Comcast and other providers, and wireless hot spots are the only alternative for millions of residents. Wireless Estimator’s staff members were particularly hit hard and are recovering from the storm.